In this thread I hope to show you my journey into building a second HO layout. My first was called the GMR Underground Railroad. I will explain the roots of my first layout and why it got its name and how my new layout got its new name. Great interview and layout visit video. ... it was nice to see your layout that your working on there. I kept looking for Spiderman, but could not see him anywhere. I'm glad you got a chance to see my layout, a work in progress. Like Chris said, lots of stuff and until I progress a little further, no place to put that stuff. As for Spidy, he is on a special assignment, lokking after my unfinished buildings on the backside of that wall that I talked about. Hi Ralph, great interview by Chris, and it was nice to see your layout that your working on there. Here's a little bit of an update. This summe, starting in late spring, my attention went to two major home renovations in preparation for us to host a wedding here at the house. My oldest son and his then, fianc�, decided to tie the knots here, in our back yard, with the reception in the house. Those renovation along with some alteration to the water supply lines to my pond in the garden have taken up almost all my time. I just recently got back to working in the train room. Just this past Monday, Chris Lyon and his wife Lela came to Toronto and stayed over for very nice visit. During our time together, Chris and I did a little interview with me and my layout as the topic. It was fun and painless, I hope you enjoy them! Now that I've got the Lighthouse 90% complete I can concentrate on the surrounding area. I have used a technique that the Aussies use called Frocks. For those that don't know the term, Frocks are made from upholstery foam. I changed the process slightly. 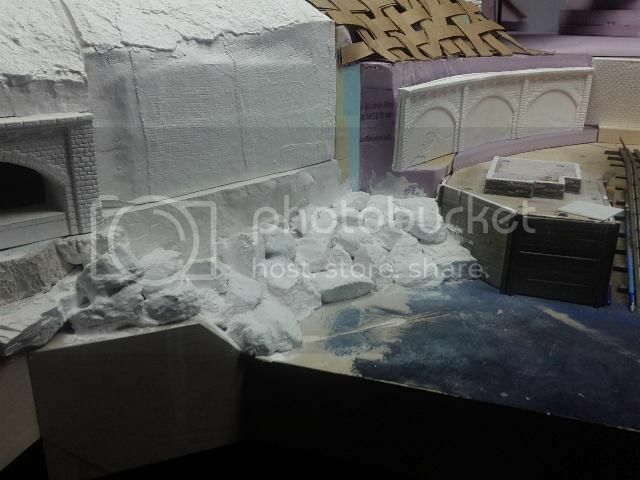 Instead of gluing the foam in place and brushing on a soupy mix of drywall mud, I chose to use Plaster of Paris(PoP). I would take a piece of foam by just tearing off the main piece, dipping it into a soupy mix of PoP and then place it on the layout to cure. Drywall mud has to air dry and PoP is thermal cure product. I let that cure overnight and then used a brush to paint on a soupy mix of PoP to seal the surface and eliminate the foam bubble look. Here is what it looks like after its cured and dry. I haven't post here for a while but that doesn't mean I haven't been working. I took a little break to take part in the S-B-M Challenge and building this Lighthouse. I've sort of put the bridge on hold while I figure out the connection to the mainland/hillside of the helix. The Through Truss goes from the main bridge, over a Highway Bride and into a tunnel portal. I have almost completed the Lighthouse here is a couple of videos of the light beam in operation. Jeez, I'd better leave you alone, you have plenty of work to do. The next thing I'm working on is the HO town in the corner beside the helix. The idea is to model the town using some of the techniques I learned from a dear friend Earl Smallshaw on forced perspective and try to emulate Mark Dalrymple's multi-level technique he used on his corner module. My idea is to make three or four removable town modules just in case there is a derailment under the town. So what you see here is the hand holes for access to below just in case. Quite a feat of model railway engineering that you have in the works there! Greg, I'm working hard to make it look as realistic and believable as I possibly can. Really like the way the bridges are framing the scenes! Kinda giving me a "John Allen moment" there ... good stuff! Yikes, atsa�some bridge. The stone work looks terrific; you need to post some of those pics in this month�s photo section on stonework. Frank, did you expect anything less from an Italian. Stonework is in my blood, literally. My Dad was in the monument business and I worked for him for a few summers. Don't worry I think I got the wiring. I wired it above the layout now all I have to do is install it under the layout and test it again. I'll pass on the wiring. My next piece of trackwork wiring will be the Fast Tracks Double Cross over. Here is the wiring diagram I got from Tim at Fast Tracks. It's bad enough that the big bridge has broken the continuous loop, if I don't get the frogs and diamond of the double cross over done I can't run trains when the bridge is finished. The bridge with the stone abutments makes a very impressive model.